UK power curve struggled for any clear direction. 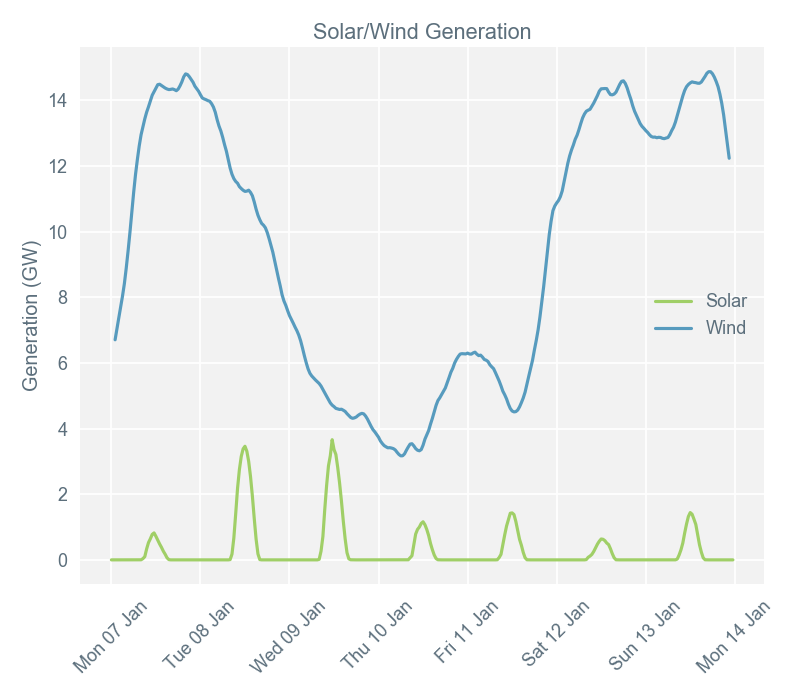 Wind output stood at over 14GW on several days, reaching almost 50% of generation mix. 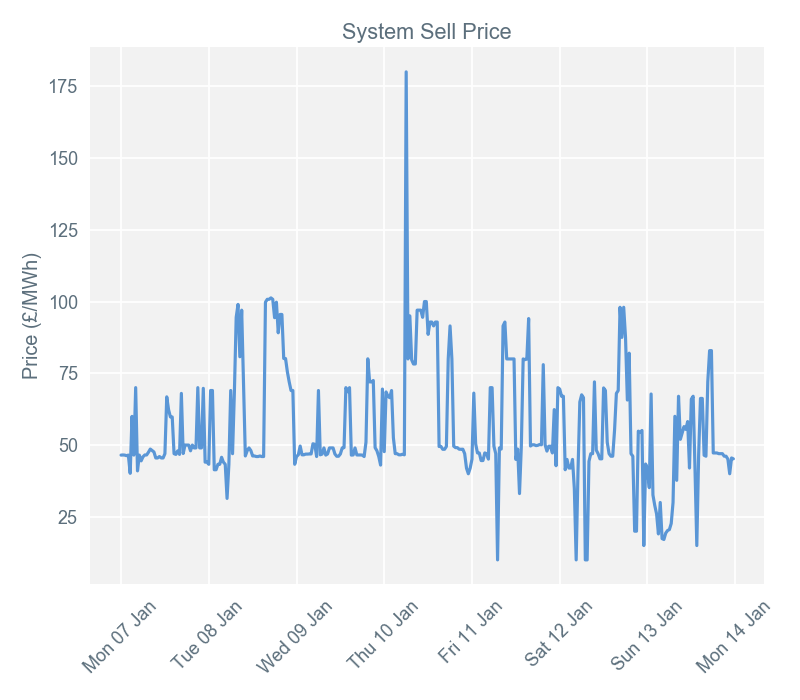 Imbalance price spiked as UK system flipped from long to short; pumped storage hydro used. Cold weather forecasts for France influenced power curve in UK. 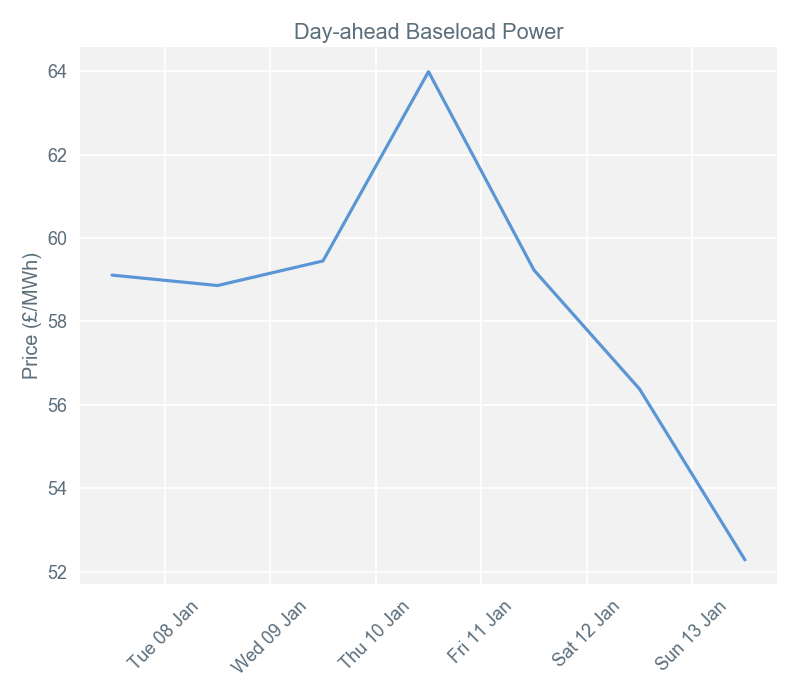 Prices for baseload power for delivery the following day were turbulent during week 2. There was a range of over £11.50/MWh between the high for delivery on 10th Jan and the low for delivery on 14th. These extremes were largely driven by expected wind output, which exceeded 14GW at both the beginning and end of the week. Cold weather is forecast to arrive in the UK from the continent within the next 7 days (i.e. in week 3). This added some premium into near-term prompt products, reflecting the risk of extra demand and tighter supply margins. High levels of wind output throughout much of week 2 didn’t result in any periods of negative imbalance prices. The lowest price of £10/MWh was for settlement period 15 (07:00-07:30) on 11th January - a time when wind output was relatively low for the week. This low final imbalance price was the result of National Grid accepting the bid by South Humber Bank power station (a gas-fired plant) to reduce generation output. The highest price for the week of £180/MWh was for settlement period 13 (06:00-06:30) on 10th January. At this time, the UK system shifted dramatically from being in slight excess of generation for a number of settlement periods to being short of power. National Grid took urgent action and accepted offers from a number of pumped storage hydro generators. While the final price was set by Dinorwig pumped-storage hydro, the system operator’s accepted offers from Ffestiniog and Cruachan made up the majority of the actions taken in that period. Wind output exceeded 14GW on a number of days during week 2, contributing close to 50% of the generation mix at times. When the wind wasn’t blowing, gas-fired generation filled in (as it always does) by ramping output up and down to match demand. National Grid called upon pumped-storage hydro generation numerous times during week 2, making up for both sudden drops in generation output and demand spikes. The reliance on this technology isn’t surprising; it’s a fast-response, low carbon grid balancing tool that can be utilised daily. For example, at 15:53 on 8th January, pumped storage was generating 0.4GW; just 12 minutes later, it had peaked at 1.6GW - a high level of power output in a short amount of time. 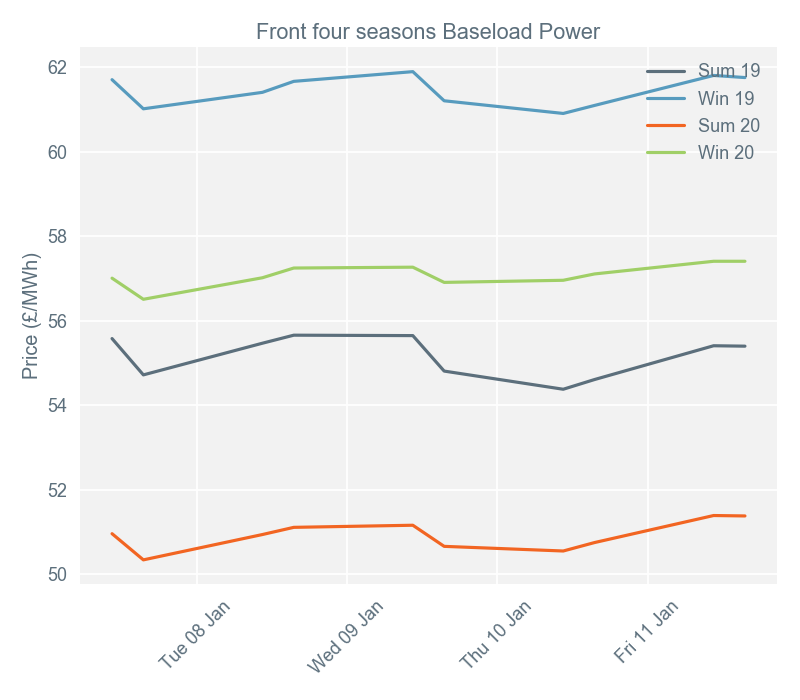 Secure and promote* (Seasons +1, +2, +3, +4) baseload contracts saw average gains of just £0.17/MWh, although prices were fairly turbulent across the week and struggled to find clear direction. Trading on 8th January saw bullish movements from the prompt and the curve, following a rise on the National Balancing Point (NBP) gas market. The prompt gas uplift came from higher demand forecasts for the following day (9th January), with these gains filtering out to the curve products. The wider fuels (oil, coal and carbon) all traded up during the 8th, providing further bullish momentum. On 9th January itself, bearish influence from the wider fuels provided downward impetus to the power curve, before seeing further gains on 10th and 11th. 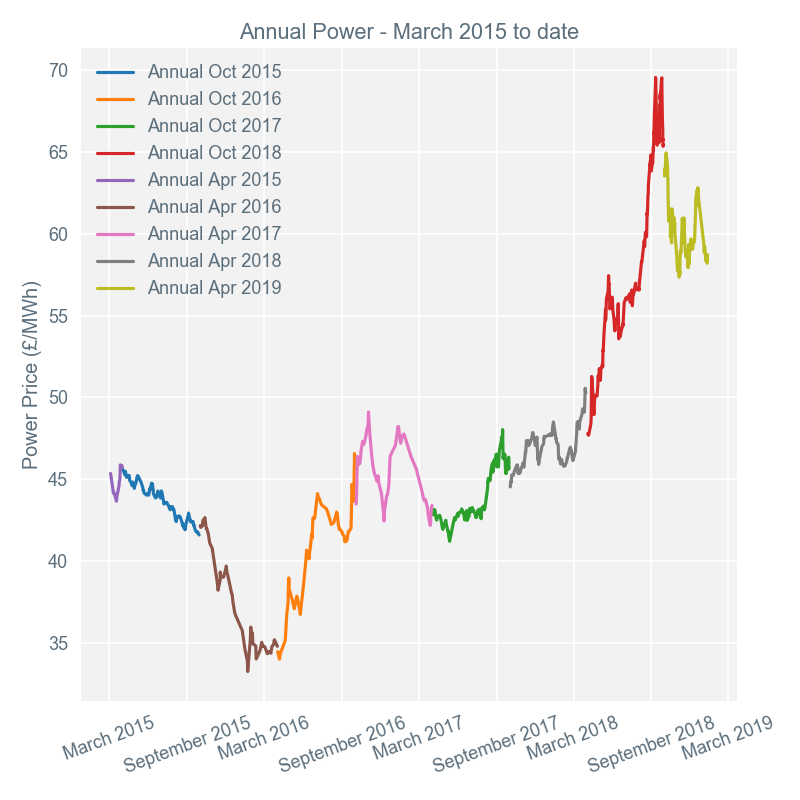 The French power market is typically very sensitive to temperature, and with the UK regularly buying power from France, any forecast of cold weather makes these imports more expensive. With a colder front expected, a related risk premium was priced into the prompt and curve products on 12th January. This was strengthened further by reduced nuclear capacity in France over the short term.